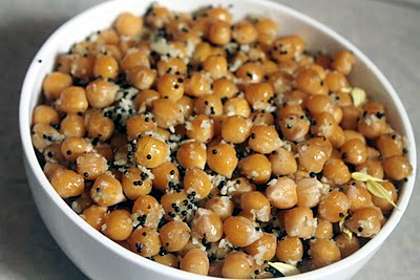 Chickpea/ Kabuli chana/ Garbanzo Beans Sundal-It is known as ‘sundal’ in Tamil and ‘gugari / ghugari’ in Kannada. Hi friends! Here is one easiest recipes to put together. Channa/Chickpea sundal are made during Navaratri or Ganesha chturthi in South India. It is great as a snack at any other time too.We can always make a variety of sundal for any festival as it is very easy to prepare and an absolutely guilt free snack or breakfast to compensate the extra calories from the fried stuff and sweets made on festivals. Soak Chana overnight or at least for 8-9 hrs, Add salt and pressure cook ,after the first whistle, reduce the heat and after 20 minutes remove from the stove. Let the pressure cooker cool, open the Chana should be soft and firm to touch and should not be either hard or mushy. Drain the chana and keep it aside, you can use this drained water to make healthy soups. Heat oil in a kadai and crackle mustard seeds , add curry leaves fry for few seconds ,add grated coconut and fry it for a minute. Add cooked and drained chana and mix well and blend it with seasoning on low flame for two minutes. Switch off the flame and add lemon juice and mix well. Serve them hot, warm or cold as a snack or with breakfast. If using canned chickpeas, drain water and use. I used here dry white chickpeas/Garbanzo beans/Kabuli chana. I soaked and cooked according to instructions given above. Chickpeas have been associated with a number of possible health benefits for medical conditions. We will go through each condition one at a time. Studies have shown that type 1 diabetics who consume high-fiber diets have lower blood glucose levels and type 2 diabetics may have improved blood sugar, lipids and insulin levels. The iron, phosphate, calcium, magnesium, manganese, zinc and vitamin K content present in chickpeas all contribute to building and maintaining bone structure and strength. Maintaining a low-sodium intake is essential to lowering blood pressure, however increasing potassium intake may be just as important because of its vasodilation effects. Selenium is a mineral that is not present in most fruits and vegetables, but can be found in chickpeas. It plays a role in liver enzyme function, and helps detoxify some cancer-causing compounds in the body. Additionally, selenium prevents inflammation and also decreases tumor growth rates. Research shows that including chickpeas in the diet lowers the amount of low-density lipoprotein (LDL) cholesterol in the blood. Choline is a very important and versatile nutrient in chickpeas that help with sleep, muscle movement, learning and memory. Choline also helps to maintain the structure of cellular membranes, aids in the transmission of nerve impulses, assists in the absorption of fat and reduces chronic inflammation. Because of their high-fiber content, chickpeas help to prevent constipation and promote regularity for a healthy digestive tract.